This community thread is dedicated to everything K-ON! The story of Yui and her high school girlfriends and their time in the light music club. Here you can discuss relevant topics like the anime, the manga, music, etc. Bought a new K-ON! body pillow? Post about it here. Watched an episode of K-ON!!? Post about it here. Saw a crack in a wall that looked like Mio? Post about it here. Just try to remember the rules of the forum when you post... Ignorance is not a valid excuse. The mature, yet incredibly shy girl of the light music club, Mio plays a left-handed, 3-Color Sunburst Fender Jazz Bass with a tortoiseshell pickguard. Despite being mature in appearance, she has a very girly side that comes out in the lyrics she writes for the band. She has the "most talent" of the group. Self-proclaimed president of the light music club, Ritsu plays Yellow Rick Marotta Signature Yamaha Hipgig Drum kit with an add-on floor Tom, Cymbal set from Avedis Zildjian. Childhood friend with Mio, Ritsu tends to drag her into all sorts of things. Ritsu would make a good boy friend. Often referred to as "Mugi" by her friends, is a wealthy girl with a gentle and sweet personality who plays a Korg Triton Extreme 76-key keyboard. Despite her wealth, she is fascinated and finds joy in "normal" everyday activities, such as ordering fast food. She tends to bring tea and cakes to the club room for the girls to eat. She has a fondness for yuri manga. Yui's younger sister. Since their parents are rarely ever home, Ui fills the role of mother for her sister. She's pretty much perfect in every way. After the seniors graduate, she joins the light music club with Jun and Azusa. Music Teacher and alumna from Sakuragaoka Girl's High School. When she was in school she too was in the light music club, where she and her friends played death metal music in their band Death Devil. She is forced to be the new adviser of the new light music club, as Ritsu blackmails her after the girls learn of her past. Yui's childhood friend and confidant who is a member of the school's student council. She becomes friends with Mio as well during their second year in school, and unbeknown to Mio, is also the President of the Mio Fan Club. One of Azusa and Ui's classmates and close friends. She joins the jazz Club, but after a while starts to get jealous of Azusa's stories of her time with the light music Club, where she eventually joins for their senior year along with Ui. K-ON! began as a four-panel comic-strip manga written and illustrated by Kakifly in May 2007, and ended on September 9, 2010 with a total of 4 volumes. The manga folows our hero Yui through her high school career where she joins the light music Club and makes friends with Mio, Ritsu, Mugi, and Azusa. The Manga was then relaunched in April 2011 in two separate magazines, with one following the exploits of Yui and friends as they attend college, and the other follows Azusa, Ui and Jun in their senior year. The manga was licensed by Yen Press for English release, with volumes 1-4 as well as the K-ON! COLLEGE and K-ON! HIGH SCHOOL volumes. There is an anthology entitled Minna de Untan!, which features several guest strips from various artists. An official anthology series, K-ON! Anthology Comic, began sale from November 27, 2009, with five volumes released as of October 12, 2011, and two "Story Anthology Comics" were released on November 26, 2011. 2017 marks the 10th anniversary of the beginning of this legendary franchise! Bandai Entertainment released the first season in North America in 2011, while the second season has been licensed by Sentai Filmworks and was released in the west in two volumes on June 19, 2012 and August 28, 2012. Bang Zoom! Entertainment produced the first and second season of the dubs as well as the movie! You can watch the series on Hulu, and if you really want to, you can buy the movie on Steam, for whatever reason... 2014 marks the 5th anniversary of the first anime season! Since the show is about a music club, naturally their would be music. If you're interested, many of the songs are available on Apple Music. If non-physical isn't your thing, you can collect HTT's various songs both on CDs and 7 inch vinyl albums. K-ON! Hōkago Live!! is a PSP rhythm game developed by Sega. The gameplay involves you matching button presses in time with music featured in the anime. 19 songs in total featured from the first anime season and first set of character song CDs. Though the real meat of the game is that you can customize the clothing, hair style and accessories of the HTT girls, plus you can decorate both the club room and Yui's bedroom. K-ON! Hōkago Live!! was released in Japan on September 30, 2010. 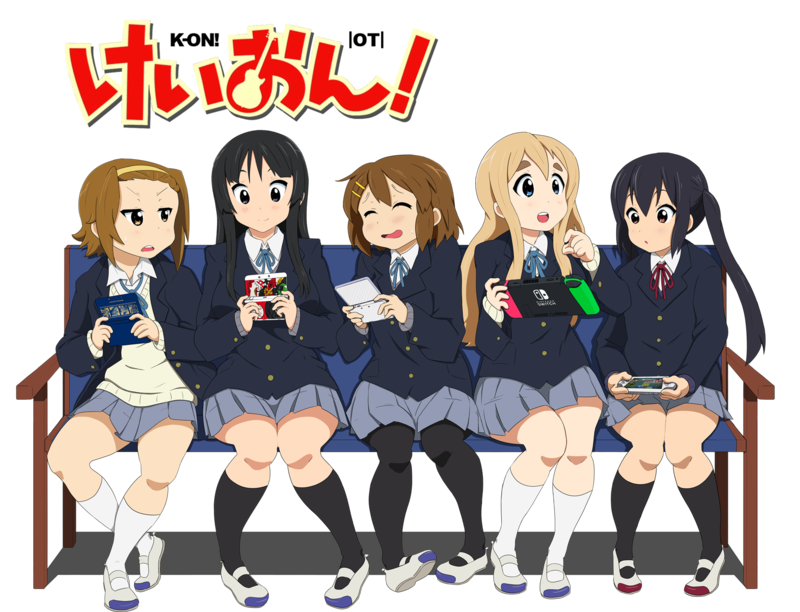 A HD port of K-ON! Hōkago Live!! was released for the PlayStation 3 on June 21, 2012. Unfortunately, there are no plans for a western release, however both games can be imported, region free, here, and the game is quite easy to understand and navigate through menus with little to no Japanese language experience. K-On! Hōkago Rhythm Time is an arcade rhythm game, developed by Atlus, which hopefully means Sega can't just sit on the license anymore. The game features trading cards as rewards that can be used to get new songs in the game. A game I'll probably never get to play, but it sounds cool! Besides music singles and video games there are all sorts of kinds of K-ON! merchandise. Ranging from anime figures, to body pillows, to toasters, to trading cards. Think of anything and there's most likely a K-ON! themed version. The thread that started it all for me. trying to rebuild the club, hm? Finally, I was going to ask you in GAF for that k-on thread. I'm just really slow, ok? Oh man I should get back to watching this. Loved s1, and I stopped halfway through season 2. Yui is so adorable lol. Season 2 is paced a lot slower than season 1, but it has some of my favorite episodes and is an all around great season! The band's all back together. Oh man this board doesn't display top posters in a thread AFAIK. Which started more than five years ago! Where has time gone? I've a question: Avvy's are scaled to 100x120, arent they? I've inspected the code with the DOM inspector of Chrome and the avat css class in the profile screen says witdth:96, height:96 but in the forums it's set to 100x120. Also, is my avvy too lewd or is it ok? EDIT: Thanks Chet for letting me know where the keions are all together! I think I read the max dimensions are 200x200, but I really don't actually know. So for the time being, I'm just sticking to the old format. It says on the page 200x200 but for some reason it scales them down to 192x192 when you upload them. Its been that long since I've watched the anime?! I remember when I first came here that I was only through season one. Kazzy would always give us their thoughts on single episodes. The movie release and the wait for it to come to DVD/BD. Good times. hm. no wonder my avatar got blurrier. In the profile page when you click an user's avvy it shows images up to 192x?? ?px (didn't see any css rule about the max-height, only the max-width). It doesn't scale, IDK if you put a larger image than this it scales. In the board itself where messages are post it shows images up to 100x120px. Larger than that it'd scale. So there's no way to make it appear flawless (unscaled, uncropped) in those 3 places at the same time. You have to resort to commit to 1 place. I decided that the board is more important. i picked the 100x120 version i had from a while ago. seems that it does look better since this one was smaller. Yeah it actually annoys me a lot lol. For me, S1 is just a taste tester, S2 is where the real K-On begin. The movie managed to get even better than S2. Yeah I really enjoyed S1, but S2 felt better overall. I love the openings for this show. S2 has the Mio Fan Club so yeah best season. ERA needs to solve the images on mobile issue. Desktop version is in tip top shape, but mobile doesn't play nice with https. Gotta change image links to http to make them appear here. For now at least. And the Kyoto trip, probably my favorite episode! DP, but since no one else was going to say it, Happy Birthday to Azunyan! 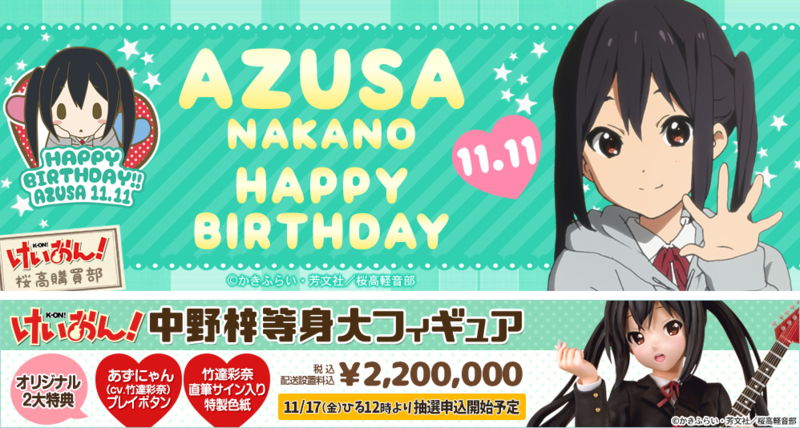 I got on here a little late, but Happy Birthday Azusa! Also the Kyoto trip is one of my favorite episodes as well along with the episode that came after it that focused on Azusa, Ui, and Jun. The school festival and summer fest episodes are some other favorites of mine from K-On! I enjoyed season 1, but season 2 I enjoyed even more and of course I loved the movie. Oh hey, you finally joined up Chet. 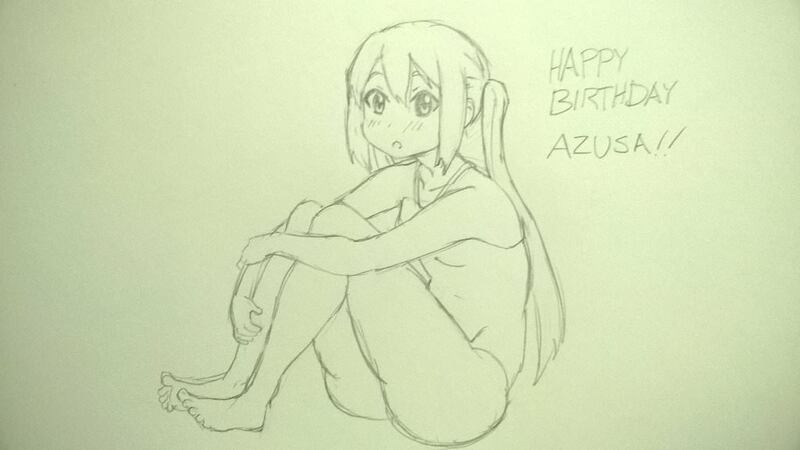 Late Happy Birthday to Azusa! Speaking of Azusa's birthday, they unveiled a life sized statue of her! So here has like 20 grand to blow on this? I'd rather spend twenty grand on a statue of Oscar Francois de Jarjayes or Utena Tenjou tbh. Maybe when I win the Lotto. Well you're in luck, you gotta enter a lottery to get a chance to buy the life-size Azunyan! Don't you go there like 10 times a year?